As rationing was implemented, it became obvious that if there was not enough food to feed people, there was not going to be enough to feed animals. Since there was a shortage of grain to feed chickens, millions of commercially-farmed hens had to be killed and sold as food. 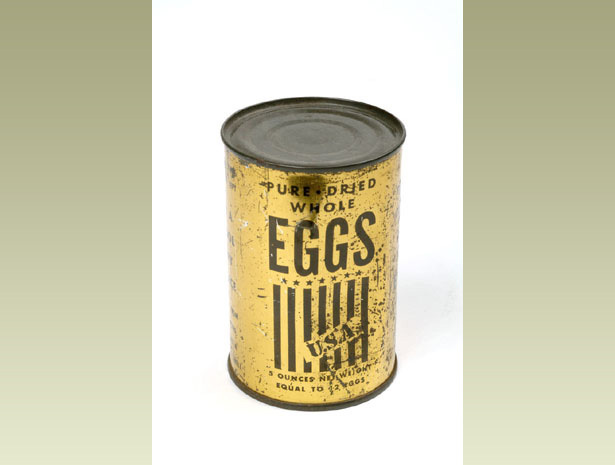 This ultimately led to an egg shortage, and rationing was implemented allowing a person one fresh egg per week; extra allowance was allowed for those with special circumstances such as giving expectant mothers and vegetarians two eggs a week. 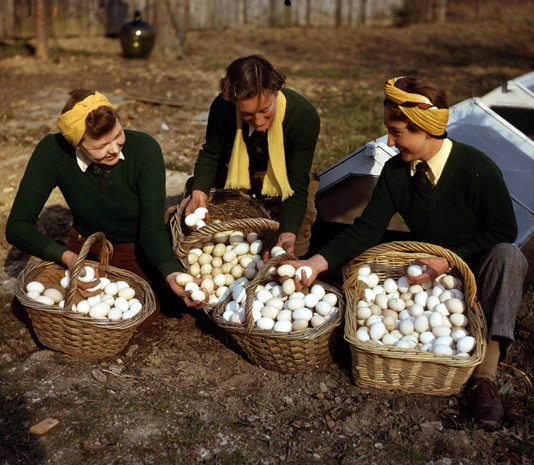 With egg rationing, people started keeping chickens in their back yards because that meant one could have unrationed eggs. 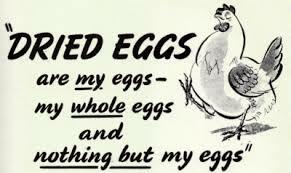 But, there was a catch: if you raised chickens, you had to give up your egg ration, but you were given a grain ration instead for your chickens. Saving, cooking, and grinding vegetable scraps and feeding those scraps to backyard chickens became the norm for many families. Families also kept eggs fresher and storing them for longer periods of time with the pointy side down in a rack, and the rack inserted into a pail filled with waterglass (a liquid mixture of sodium silicate). Waterglass sealed the pores of the eggs and allowed them to stay fresh. 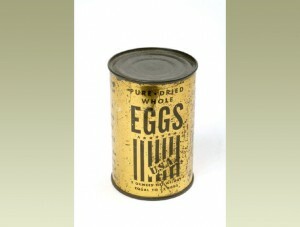 As eggs continued to be rationed, by July of 1942, powdered eggs became available courtesy of the United States. The allowance was one tin, or packet, of dried eggs every two months. One tin was equal to 12 fresh eggs. Powdered eggs had a long shelf life; they could be hydrated on a one to two basis: one tablespoon of egg to two tablespoons of water. 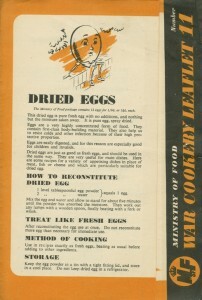 The Ministry of Food issued a leaflet explaining the use of dried eggs. This dried egg mixture is pure fresh egg with no additions, and nothing but the moisture taken away. It is pure egg, spray dried. Eggs are a very highly concentrated form of food. They contain first-class body-building material. They also help us to resist colds and other infection because of their high protective properties. Dried eggs are just as good as fresh eggs, and should be used in the same way. They are very useful for main dishes. Here are some recipes for a variety of appetising dishes in place of meat, fish or cheese and which are particularly suitable for dried egg. Mix the egg and water and allow to stand for about five minutes until the powder has absorbed the moisture. 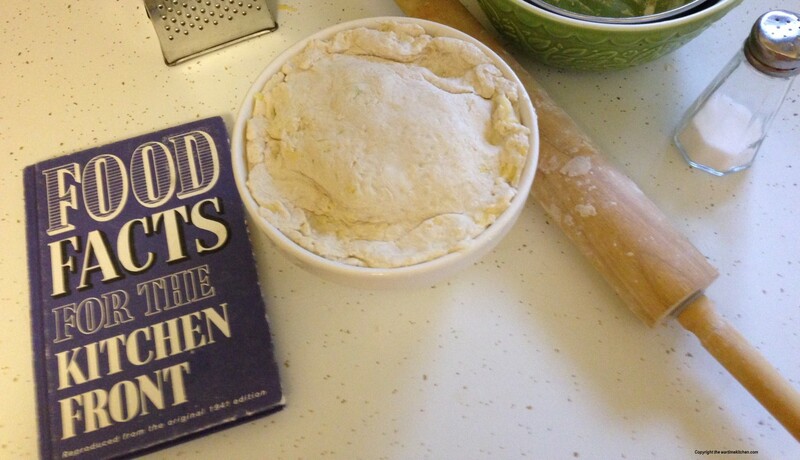 Then work out any lumps with a wooden spoon, finally beating with a fork or a whisk. After reconstituting the egg use at once. 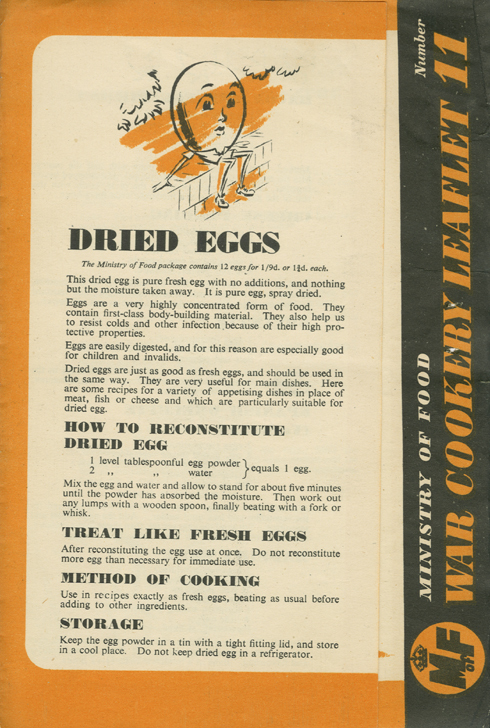 Do not reconstitute more egg than necessary for immediate use. Use in recipes exactly as fresh eggs, beating as usual before adding to other ingredients. Keep the egg powder in a tin with a tight fitting lid, and store in a cool place. Do not keep dried egg in a refrigerator.